Xfire Password Decryptor is the FREE software to instantly recover login passwords from Xfire Gaming Messenger. Xfire is a free tool that automatically keeps track of when and where gamers are playing games online with more than million members. Xfire eliminates the hassles of running multiple programs like IRC, instant messengers to keep track of their friends. Xfire Password Decryptor helps in quickly recovering all the stored passwords by Xfire. You can copy the configuration file (Xfireuser.ini) from the compromised system to local system and then use it to recover all the passwords at your ease. 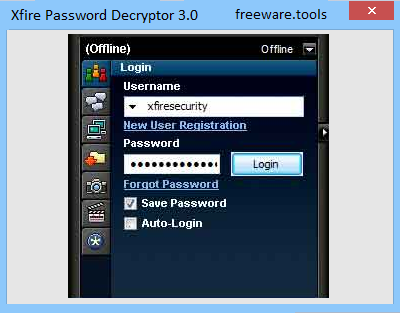 Xfire Password Decryptor is a fast, approachable and effective software utility designed to retrieve lost or forgotten passwords saved in Xfire accounts, as the name implies. It comes packed with an intuitive set of options that can be figured out by anyone, even those with minimal background in such decryption software. The GUI is clean and intuitive, represented by a single window that provides direct access to all available options. All you have to do is point out the Xfire settings file with the help of either the file browser or drag-and-drop feature, and click a button to start the key recovery procedure. The password to each identified account is loaded in the main frame, and you can either copy selected entries to the Clipboard or export the entire information to file for closer examination and safekeeping. There are no other notable options offered by this app. Xfire Password Decryptor does not hang, crash or pop up error dialogs. It finds out passwords almost instantly. To sum it up, this tool offers a straightforward method for getting ahold of Xfire passwords, geared toward all types of users.